The event organisers came up with a small demonstration on cupcake and toppings, which helped the children complete the task in the given one hour. Hyderabad: Young enthusiastic chefs flocked in large numbers the Culinary Carnival hosted by The Culinary Lounge at Hitex here on Saturday. Showcasing their innate culinary talent and competing with each other, the children at the two-day event were provided with tips by Masterchef fame chef Smita Dugar. Over 26 children in the age group of seven to 12 years participated in the cupcake war, beautifully decorating cupcakes chosen from an array of toppings. The children came up with different concepts such as rocket cupcake, rose garden, island with a house and Christmas tree. “The level of imagination of these children is impressive, and they are interactive and participative,” Meghana Reddy from The Culinary Lounge said. The event organisers came up with a small demonstration on cupcake and toppings, which helped the children complete the task in the given one hour. “We kept things hygienic and made required arrangements. Similarly, students were told about hygiene and given tips regarding safety while cooking,” she said. Dugar said they were looking for a champion chef who does an imaginative and neat job. “The choice of cooking as career has increased among young students and it is good news for the industry,” she said. 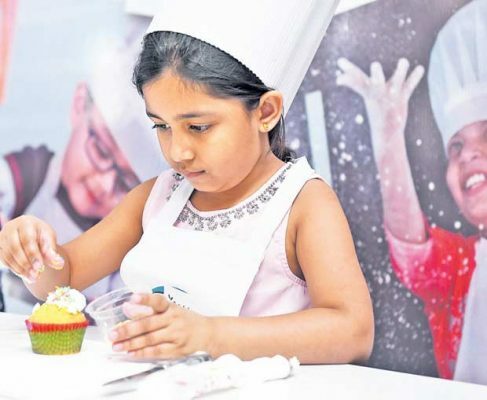 Varsha stood first, while Neysa, an Class 8 student from Oakridge International School, was awarded the runners-up prize in the Cupcake War event. Neysa said: “This is my first participation in the culinary competition and it helped me try and get to know the techniques of making toppings with ease”. The Culinary Lounge is hosting ‘Culinary Carnival’ for children at Hitex on June 2 and 3. On the inaugural day, organisers conducted two events — Cupcake War and Summer Salad Bonanza. Kitchen Aid gave away prizes of Rs 50,000 for winners. Telangana Today is the media partner for Culinary Carnival.